Now that summer is officially over it was time for me to reset my skin! By resetting my skin I mean getting ready for winter and detoxifying it from the outside in. The only way to do this is with some great high-quality products with awesome ingredients. I decided to use the Ahava’s Mineral Radiance Collection to do this. I wanted to get my glow back after exposing my skin to the sun all summer long and not applying as much sunscreen as I should have! Step one of this collection for me is the Ahava Mineral Radiance Instant Detox Mud Mask. My favorite part about this mask is that it only takes 2 minutes. The hardest part of me doing a mask is normally taking the time to do it. I apply the Ahava Mineral Radiance Instant Detox Mud Mask on my face right before my shower and by the time I have taken my hair down, got my towel ready and let the water get hot it has already been 2 minutes. It feels so good on my skin, I normally let it soak in with the steam from the water for about another minute before I rinse it off. I’ve used this up to 4 times a week just because it is so easy and fast! When I’m in the shower I like to use the Ahava Mineral Radiance Cleansing Gel. I use this everyday and it is a very gentle cleanser that will remove all dirt, makeup and impurities. It smells great and it doesn’t irritate my eyes. I love that they offer moisturizers for day and night use! The night cream that I use is the Ahava Mineral Radiance Overnight De-Stressing Cream. It is a very thick cream and it only takes a small bit to cover your entire face and neck area. It soaks in well not leaving a greasy feeling at all. I like the scent and it really soaks in over the night making my skin feel great first thing in the morning when I wake up! In the morning after a quick cool rinse to my face, I like to apply the Ahava Mineral Radiance Energizing Day Cream with an spf of 15. I love that it includes sunscreen because this is very important for your skin even in the fall and winter months. The Ahava Mineral Radiance Energizing Day Cream is also a great base to use before I apply my foundation. It smooths out my skin and leaves it looking refreshed and feeling energized. I have oily skin so the day cream works well for me and I seem to have less oil in my t-zones during the day after using it. These products work well together, but if you like just one in particular they will work well alone, too. I know even if I decide to use other products I will continue to use the mud mask simply because it is so quick and gives great results! Check out the company website, facebook or Instagram for more product information. You can find Ahava products at Jet, Macy’s, and Ulta. What skin issues do you have? Which Ahava product would you love to try to address those issues? I had never heard of this brand before. Looks like some great products. i have really dry skin and would love the Ahava Mineral Radiance Overnight De-Stressing Cream. 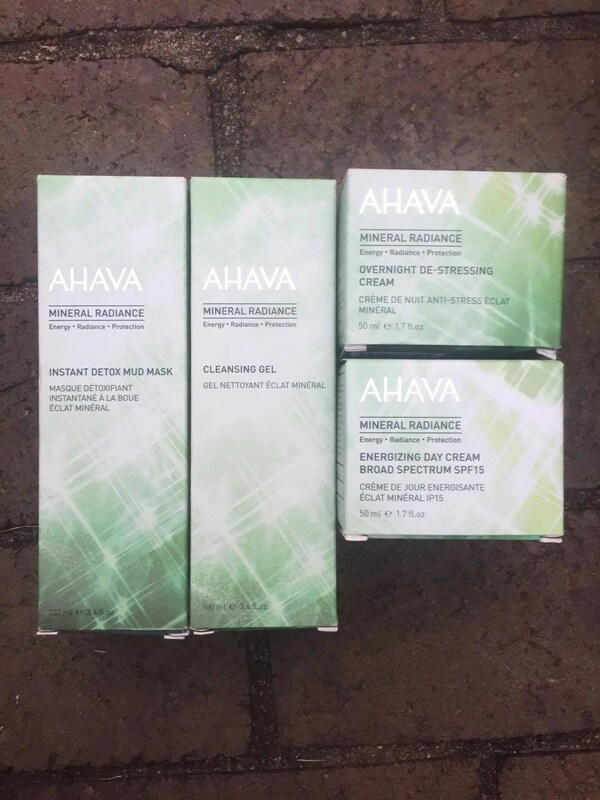 Ahava’s Mineral Radiance Collection sounds awesome. I really need to do this. Thanks! I would love to try these. Ahava makes great products. oh this would be great for me for this winter, my skin always gets so dry and cracked. I would love to try this.. Looks like it would be perfect..